A Venetian celebration within a thoroughly modern Melbourne setting. Venice. It's rich and immersive; not so much an assault on the senses but more a slow rising wave of everything that is decadent and enjoyable about life in the one place. If you haven't been to the city of gondolas and azure blue canals, though, don't sweat. You've got the next best thing right here in Melbourne: Guy Grossi's Merchant. Another jewel in Grossi's Italian crown, alongside Florentino, Ombra and Cellar Bar, Merchant celebrates Venetian heritage within a thoroughly modern Melbourne setting. 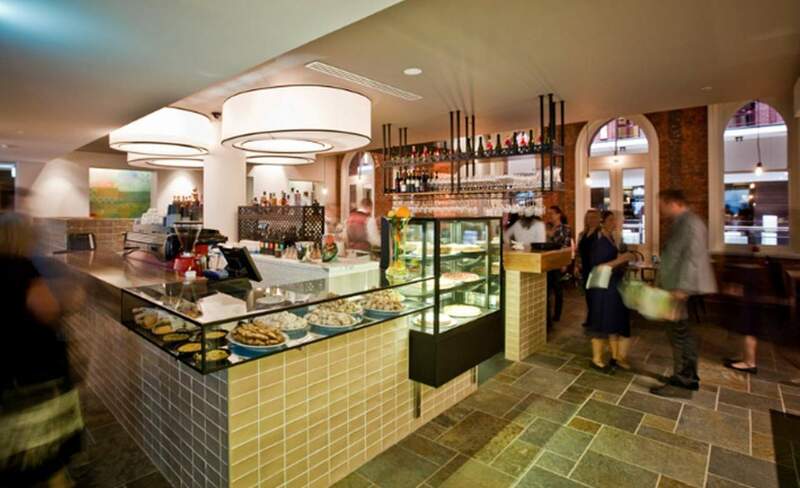 Situated at the base of the Rialto, and created in collaboration with fellow regional counterparts and acclaimed developers, the Grollo family, Merchant brings a disarming relaxation to dining out in the CBD. Intricate illustrations across the walls and rich blue undertones pay homage to the trade culture of Venice itself. Pick and choose where you seat yourself in the rolling space, whether it's at the bar, in a moody booth, or by the kitchen. This 'Osteria' setting — a place where diners come and go as they please, rather than at formal dining times — means that Merchant captures lots of shade and colour, and is the kind of place where popping in for just a drink is more than fine. Be warned however, it's likely that that drink will turn into aperitivo, and then dinner, and then dessert. Look beyond the theatrics of Merchant and the authentic, expansive offering of Venetian cuisine is mightily impressive. A variety of chiceti (snacks) will satiate any initial craving, varying from pumpkin and sage arancini ($5) to fried zucchini flowers ($6). With so many options to choose from, best you go slow here and save yourself for the entire food journey which will ensue — as the menu unfolds, so does the selection of risotto, pasta, meats, cheese and dessert. Knowledgeable and attentive staff are also on hand to help you craft your meal. To make selecting easier, settle at least on some classic polenta with olive oil and parmesan (from $7). With it, do not miss the offer a perfectly mixed Bellini ($15): Prosecco and peach nectar never tasted so good. In a city already saturated in choice when it comes to eating Italian fare, Merchant Osteria Veneta goes one step further. Branching out into the regional specialities of Venice, it's experienced, polished, and while everything we've come to expect from the Grossi empire, still remains distinctly passionate.